A months-old US intelligence report that surfaced recently speculates the missing Malaysia Airlines Flight MH370 might have been deliberately flown off course, according to an unnamed source cited by ABC News. The theory reportedly comes from evidence of the plane changing course multiple times, according to The Telegraph. The first wreckage from the plane was found this week in the Indian Ocean, which disappeared last year. It’s unclear how credible or conclusive the evidence is, however — ABC News’ source said the assessment was based on information that US intelligence officials obtained about the foreign investigation into the MH370 case, which so far hasn’t yielded any public answers about what happened to the plane. Nor is it clear whether the location of the newly found wreckage indicates that the plane was off course. The idea of foul play and sabotage has come up before. In March 2014, the same month the plane disappeared during a flight from Kuala Lumpur to Beijing, Reuters reported that military radar data suggested the plane was purposely flown hundreds of miles off the planned flight path. Around that same time, The New York Times also reported that MH370 also saw significant changes in altitude after losing contact with ground control. The multiple changes in course reportedly suggest the plane was still under the command of a pilot. Malaysian officials announced a few weeks after MH370 disappeared that all evidence pointed to the plane crashing in a remote area of the Indian Ocean with no survivors, but investigators so far have not determined the cause of the tragedy. And possible debris from the plane that washed up on an island in the Indian Ocean this week might not be much help in revealing what brought the aircraft down, The New York Times reports. Even if investigators are able to confirm that the wreckage came from MH370, it would still be nearly impossible to determine where the plane entered the water, according to experts who spoke to the Times. ReutersFrench gendarmes and police inspect a large piece of plane debris which was found on the beach in Saint-Andre, on the French Indian Ocean island of La Reunion, July 29, 2015. 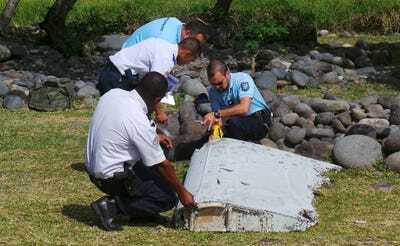 The debris could, however, prove that the plane crashed into the ocean, as investigators have always believed. And the fact that floating debris wasn’t found on the ocean’s surface in the weeks following the crash supports the theory that the plane plunged into the water mostly intact and then sunk quickly, the Times notes. This would rule out an explosion and could be consistent with the theory that the plane was deliberately flown off course and then taken down into the ocean. Flight MH370 disappeared on March 8, 2014 with 239 people on board. The discovery of the debris on Reunion island near Madagascar this week is being treated as a “major lead” in the MH370 search, Australian officials said. Crews have been searching the southern Indian Ocean near Australia for any sign of the missing plane and have so far been unable to conclusively identify any debris belonging to the aircraft.